Keep working at it. Climb the mountains. There are no cheap paths out. As I write this, it is the last day of 2017. 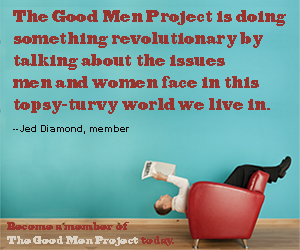 This is the fiftieth Good Man Project article I’ve written this year. Thank you for reading. I’ve been thinking a lot about labyrinths lately. This year, my stepmother sold the house and land she and my father had bought decades ago for their retirement. My father has been gone nine years now, and she felt it was time to move on. My father’s labyrinth, from Google Earth (screen-capture by author). On that land, my father had put a labyrinth. It was both simple and impressive: He made the borders of the path from stones, large enough to indicate the route but small enough to not block the way. The path was just wide enough for a riding mower to navigate. One of his reasons for the labyrinth was to annoy the system. There is a gas pipeline easement that cuts through the property, and one of the conditions of that easement is that the gas company can do work on it whenever they want, with reasonable notice. One of the other conditions of the easement is that any human structures they displace for work have to be put back, stone by stone. Putting the labyrinth there, right near the road access to the property, meant they’d minimize the work they had to do. That was my father. His protests against the system weren’t loud, they were nuanced. But they were there. Of course, though, it could have been any number of structures. A labyrinth has meaning of its own. In high school, I read a short story called “The Other Side of the Hedge” by E. M. Forster. The story is an allegory for life and death, questioning the futility of the way in which humans race with each other. What stuck with me most was the image of the labyrinth, folding in on itself. As a child, I had loved to solve mazes. Mazes have paths that split and have dead ends. Solving a maze requires strategy, such as starting at the end and working back towards the start. It is possible to get lost in mazes. “Labyrinth” is sometimes used as a synonym of “maze,” but I prefer the common distinction that a labyrinth has a single path through it (“unicursal”). Unicursal labyrinths have a long history within western mysticism. They date back at least four millennia, with examples on Cretan coins, carved into stone in India, and laid in Roman mosaic. The purpose of the earliest labyrinths is unclear, but by the Middle Ages, it became common practice to walk labyrinths while meditating. These labyrinths only have a single entry way: Meditators enter, walk the length to the center while following the twists and turns, then walk the length back out. While I was walking my father’s labyrinth, it would occur to me that my path would lead me close to the center before sending me back out to the edge. Because the rocks merely marked the path and did not block the way, it would have been so easy to simply step over the rocks to get to the center. That’s not the point. The point is to reflect on the complexities of life, to clear one’s mind, and to refocus on one’s purpose. Much like the transition between years, when many people clear out old baggage and reflect on new goals. In “The Other Side of the Hedge,” Forster seemed to be describing a unicursal labyrinth rather than a maze with multiple paths: People pass each other, and people judge each other based on that. It might seem fairer to compare real life to a maze, with its false starts and dead ends. At the same time, it’s clear that Forster’s labyrinth has a beginning and an end: People don’t travel to the center and back out again, they travel through it. The narrator wedges his way though a wall and out, but it’s clear this is not how things are meant to be. While labyrinths almost always have a single entrance, examples with two entrances appear (very rarely) in antiquity. I have long been the sort to try to find easy solutions to problems. By “easy,” I meant “short.” Teaching High School Algebra II this year has led me to reflect on how “easy” and “short” aren’t the same thing, though. Walking through a long, unicursal labyrinth is easy, but it’s not short. Solving a Rubik’s Cube seems difficult, but can be broken down into easy steps. The primary difference between solving a 100-piece jigsaw puzzle and a 1000-piece jigsaw puzzle is how much time it takes to sort the pieces. There are a lot of problems in our lives that we allow to get bigger than they are because we want parsimonious solutions. It’s not enough to break them down into thousands of easy steps: Too many steps, and we give up and try to find a shortcut through the walls of the hedge. This year I pass the half century mark of life, looking back on a past littered with half-baked projects. I’m tired of walking away from labyrinths that looked too daunting or tiring. Given that people got lost in the Minotaur’s labyrinth, the easy assumption is that it was really a maze. This is a historically convenient interpretation, since there were both mazes and labyrinths in antiquity. However, it seems strange to me that, for so long, for so many people who understood the difference, the Minotaur would most consistently be associated with a labyrinth, not a maze. The more difficult interpretation is that the Minotaur’s labyrinth is not challenging, it’s daunting. It’s tiring. It’s exhausting. People don’t get lost within it, they get lost within themselves trying to survive it. So this is my commitment for 2018: Stop giving up so easily. Keep working at it. Climb the mountains. There are no cheap paths out. The only way out is through.